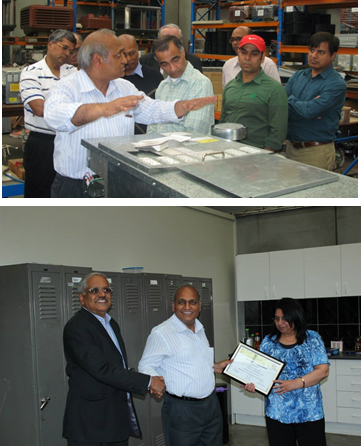 On 14 December, 2013, IITAV organised a site visit to Eco Pacific P/L, in South Dandenong, Victoria. Members had the opportunity to get a direct glimpse of what a typical SME looks like and what it takes to become a successful entrepreneur and manufacturer in Victoria. The Managing Director of Eco Pacific P/L, Dr Jai Kaudinya and Dr Rachana Kaudinya, both IITAV members, hosted the event. Jai and his colleagues described the history of the business and their products. Jai has a PhD in Heat Transfer and before coming to Australia he worked in Russia, Japan and Germany on a number of heat transfer related projects including one related to space travel. That experience gave him the lead into the innovation which helped him start this venture. Eco Pacific uses innovative technologies in their ducted heaters, evaporative air coolers and fresh air ventilators that they manufacture for the residential market. The members saw, first hand, the assembly line for the evaporative coolers which sit in the rooftops of some of the houses in Melbourne. They were also shown a government regulatory heater trial in progress to test a new generation heater. At the end of the factory tour, Jai and Rachana treated the visitors to delicious refreshments and snacks. We were delighted to have Greg Woodruff, Engineers Australia representative, join us for the visit. IITAV President Dr. Raj Rajakumar welcomed the members and thanked Jai, Rachana and their Eco Pacific colleagues and Nikhil Kumar, IITAV’s Coordinator-Networking events. IITAV wishes Eco Pacific a bright and successful future.